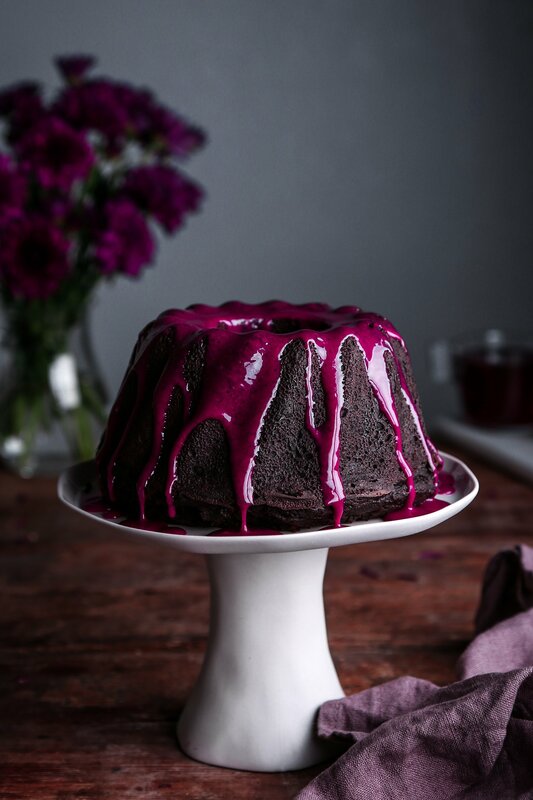 A moist chocolate bundt cake topped with a vibrant hibiscus glaze! This cake is vegan friendly and free of gluten, dairy, eggs, and refined sugar! Preheat oven to 350ºF. Liberally grease a 12–cup bundt pan with coconut oil or vegetable shortening and set aside. In a large mixing bowl, combine flour, sugar, cocoa powder, baking soda, and salt and mix until well blended. Mix in coffee/milk, oil, yogurt, vinegar, and vanilla stirring together just until well combined. Place cream cheese into a mixing bowl and beat with a hand mixer until creamy. Blend in maple syrup and then milk, a tablespoon at a time, just until the glaze is thin enough to pour over cake. Stir in hibiscus powder and vanilla. See notes for other flavor ideas. Mix chocolate and coconut milk together in a heat-safe bowl and place over a pot of simmering water. Start with less milk and add more, as needed, until the chocolate easily drizzles off of a spoon. Glaze will set as it cools, so pour over the cake right away, while it's still warm. *If you don't have access to hibiscus powder, you can use a few teaspoons ground freeze-dried raspberries/strawberries, 2–3 tablespoons cocoa powder, or omit altogether for plain cream cheese glaze.